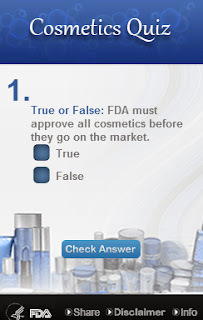 Whether you are preparing to create a new cosmetic product or researching what risks and regulations are involved in the development and formulation of cosmetics, the FDA has recently released a Cosmetic Quiz Widget to test your knowledge and provide insight into the cosmetic marketplace. The ten question quiz sheds light on cosmetic definitions such as hypo-allergenic, as well as FDA procedures surrounding new products. Take the quiz to see how much you know about cosmetics and read more about cosmetic formulation on our Cosmetic Formulation Page.